We fit in a medium-length hike and got sidetracked watching a helicopter work on a small forest fire. Then we returned to the hostel in lots of haze and smoke in the air. We woke up early enough to try to get a jump once again on crowds. It seemed that the kitchen area didn't open for another hour, but since we knew that there were no doors closing it off, we figured it was because there were some rooms off the common area. Ends up, we got down there and a couple people were milling around in the area already, people who worked at the hostel. We quickly (and quietly) ate our breakfast, gathered our things, andset out to Yoho. Having checked the weather, there was a chance of rain in the afternoon, so we opted for the shorter of our two hikes, the Emerald Lake and Basin Trail. We had noticed a sign the day before which said that parking at Emerald Lake was extremely tight. Fortunately, we arrived early enough that there were plenty of spots. Our planned hike was seven miles, going around the Emerald Lake, with another segment about half way around which went up to Emerald Basin. The trail app I had suggested we go counterclockwise around the lake; that's what we did. Looking at the lake before we started hiking, we noticed some smoke coming from a small section in the forest above the east side of the lake. Good thing we were going past that side of the lake first. The first thing we came across was Peaceful Pond, which was exactly as described. Mirror-smooth and tucked away from the road and the main lake. Not long after we started out, another couple was coming the other way, so we said hello. 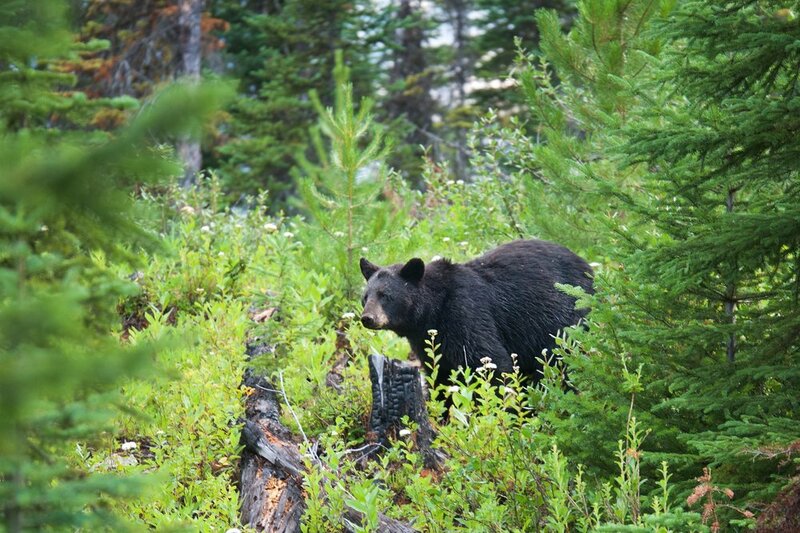 They mentioned there was a black bear about 50 meters ahead of us, but they assured us that he was very gentle. We went warily ahead, making sure to make noise. Melody spotted the bear on the lake side of the trail, which seemed strange with all the people wandering around. The bear was not full-sized, but close enough that we didn't dally; I grabbed a couple shots, but was quick and my camera decided the tree stump a few feet in front of the bear was more interesting. Fortunately, the focus is close enough. We walked past another group of people who seemed a bit alarmed that there was a bear, which seemed a more appropriate reaction than the original couple. Further down the trail, we started chatting with another couple, this one from Ventura County. They were planning on going on the Burgess Pass trail, which went up the hill just past where we were, the same hill we saw the smoke. We were hoping the trail would cut over far away from the fire activity. As we progressed around the lake, it seemed less useful to warn people about the bear, since they still had a way to go, and we had no idea whether it was still there. Across the lake we saw an avalanche chute going down the mountain, a very obviously cleared section free of trees. We also were hearing lots of helicopter activity between the lake and the mountain, so they had started working on the fire. When we got to the far side of the lake, there was a wide open area where we got a really good look at the helicopter picking up water from the lake, then dropping it onto the fire. We watched a few rounds; I'm sure the people boating on the lake also got a good view, as long as they didn't get too close to where the helicopter was picking up water. Tearing ourselves away from the fire activity, we started up the Emerald Basin Trail. It was flat, easy going at first, then took a turn and became pretty steep. At points it was so overgrown we were wondering if we needed a machete. It then leveled off again, and when we got to where the trail was supposed to end, there wasn't a definite ending point. We ended up going a bit further, going across a small stream, and looked around. There were other people there too, as well as more people who were arriving. Having taken a break, we proceeded back down the hill, running into the couple from Ventura who were going up the Burgess Pass trail. As they were going up, they noticed that the water being dropped by the helicopter started looking more and more like it was right above them, then they saw someone going the other way saying she was told to turn back because of the fire activity. The rest of the loop around the lake was pretty uneventful. While the fire didn't seem to be put out, it did seem pretty well controlled. The helicopter wasn't doing any more water drops, but did seem to be doing supply drops. We went back to the car, dropped off our stuff, then thought about lunch. There were several picnic tables close to the parking lot, but most of them were taken. Walking past them, it seemed several of them had only a couple people at one end, so we would be able to double-up on the other end. A light shower began and ended pretty quickly, so by the time we got to the picnic tables, they were empty. The picnic table seats were mostly dry, so we sat down to eat. As we were finishing up, the rain started up again; not heavy, but enough that we quickly finished up and started walking back to the car. By this time, it was closer to a light rain. It didn't seem heavy enough to worry about, especially since we had our hats on. However, every structure we walked past which had some sort of overhang had several people trying to keep dry, and we saw other people dashing between different overhangs. We looked at each other, shrugged, and continued walking to the car. The drive back to the hostel was not quite an hour. Once we got out of the park and started descending, we noticed there was a smoke smell. Then we started seeing it getting pretty thick, enough so that all traffic slowed way down since visibility was reduced. As we dropped in elevation, the visibility got better, but there was still a lot of smoke all around. Before getting to the hostel, we filled up. Back at the hostel, we did a grocery run, then did our normal dinner and evening routine. The next day would be a bigger hike, so we tried to get to sleep early.